“You try to keep them at arm’s length. If you let them get close, you never know what they might ask for. On the boat the survivors start talking to me, pleading their case, like I can do anything for them. It’s not part of my job to have to listen to their stories. There’s too many of them. And it makes you think. About the randomness of I get to walk these streets and he doesn’t. April 29, 2015: I’ve been in medical school since September, and it’s flying right by. There’s much to learn. Sometimes I’m asked “why did you leave the law?” The best answer I have is that I didn’t actually leave the law (I couldn’t do that even if I wanted to), I just wanted to explore different aspects of it, and find new ways to use my legal education. Lwam Ghebrehariat was acting as duty counsel on one of the days former Justice of the Peace Robert Whittaker made controversial remarks to a defendant in court. He felt Whittaker “totally failed” to appear unbiased in the case. July 2014: I’m doing a solo in the Toronto Fringe! Check out the details below. Here’s a Toronto Star story about it. And BlogTO has put me on their list of 15 promising shows! Tickets are available here! The hilarious experiences of a legal aid lawyer, underemployed actor, and East African hockey legend. 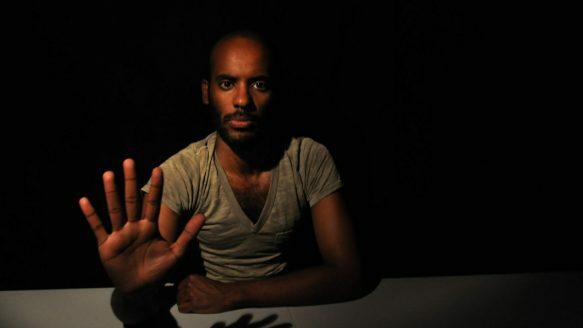 Lawyer and performer Lwam Ghebrehariat (“Outstanding Performance”, NOW Magazine, 2010) weaves together the raw material of his life, playfully exploring the themes of justice, race, and relationships. Cosimo Tucci’s (a great and funny guy!) “Just Talking” is a stand-up special that will be filmed live as the ending to a feature length documentary film titled Just Talking. I’m currently writing and producing a solo show which I will be performing at the 2014 Toronto Fringe Festival (July 2-13, 2014)! I’ll be doing 45 to 60 minutes of stand up comedy and story-telling. It’s going to be a lot of fun. Topics will include law, identity, politics, and what it means to be Eritrea’s greatest hockey player. Stay tuned for more details! Friday September 21 I’m hosting a comedy show and buffet for lawyers and friends! Register early at http://www.cba.org/pd/details_en.aspx?id=ON_12YLD0921T! On Friday September 21, 2012 I will be co-hosting a comedy show featuring stand up, improv, and sketch comedy performed by lawyers! The show is called THE FRIVOLOUS AND VEXATIOUS SHOW and will be at the Free Times Cafe, 320 College Street, Toronto, at 8:30. All are welcome! More details to come! Lawyer, Comedian, and now medicine! talk about life long learner and an inspiration brotha Luwam. How do I keep in touch, to understand your experience navigating through the medical field? Hi Samuel! Thanks for your comment! Feel free to email me at Lwam.ghebrehariat@gmail.com! Have a great day!